Oh, how I love these six sisters! They have saved many a dinner time for me! I reviewed their previous cookbook, and some of those recipes have become new family favorites. I make them all the time. I was really excited to get this new book and try some more recipes! I love the format of this book. It is different from the last one in that the recipes are combined into three courses. So, there’s usually an entree, a side, and a dessert. Sometimes instead of a dessert there’s a fun slush or dip. It’s great. I also love the extras that come in this book. The 52 conversation starters are fun. For example, number 13 asks, “Which character in a book best describes you and why?” There are instructions for a DIY chalk menu board and a list of staples you should have in your pantry. I love the idea for a “Thankful Tablecloth” and I will definitely be doing it with my families at Thanksgiving this year! 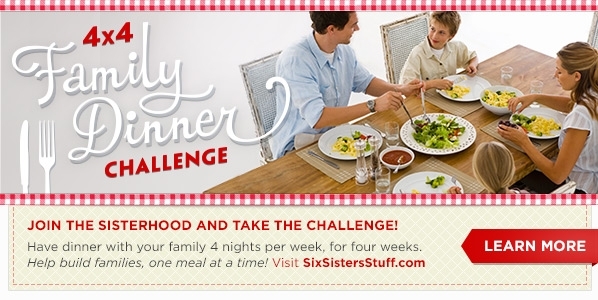 One idea that is not really healthy, but super fun, and the kids will absolutely love, is the “Crazy Dinner” tradition. On Thanksgiving Eve, mom is cooked-out. She has been working, and will continue to work very hard to get Thanksgiving dinner ready. To give her a break, everyone gets $5 and you head to the grocery store. Each person gets to purchase whatever food they want with their $5, and that is what you have for dinner. The sisters say that one of them picked a frozen pizza, another picked “crab dip, chicken nuggets, French bread, waffles, chocolate cake.” Crazy and random, right? Once a year is good for this tradition, but we may need to try it out one time. I made the “Slow Cooker Sticky Chicken,” and it was very good. I’ve been making my mom’s Teriyaki chicken for as long as I can remember, and everyone loves it. Well, don’t tell my mom, but I’ll probably be making this version from now on. It is so good! It didn’t turn out sticky, but that is most likely the cook’s error. The taste was divine, and I’m glad I put in an extra chicken breast because we ate it all! I’ve also made the “Honey-Lime Chicken Enchiladas,” and they are fabulous. Are you hungry yet? Just listen to these names: Layered Peanut Butter Brownies, Twix Caramel Popcorn, Balsamic Asparagus, Crunchy Black Bean Tacos, Butterfinger Blondies, Creamy Chicken Lasagna, and on, and on, and on. Yummy, right? Yay! I’m so excited to continue trying these new recipes out. I love adding new favorites to our list! Want to Win a Copy??? Six Sisters’ STUFF: Family Recipes, Fun Crafts, and So Much More! I have been making recipes from the Six Sisters’ website for a long time. They have some very yummy recipes! So when I got the chance to review their new cookbook, I jumped at the chance! I haven’t had the opportunity to make many of the recipes in the cookbook yet, but I did go through the entire book, page by page, and I can’t wait to get started. I want to try the “Cheesy Vegetable Soup,” the “Baked Ziti,” the “Baked Chicken Bacon Ranch Taquitos,” and the “Smores Bars” today, tomorrow, the next day…….All of the recipes look family-friendly and fairly easy to prepare. I think I already have most of the ingredients I saw in my pantry or fridge, so I should be good to go! The instructions are easy to understand, and something even I should be able to handle. Yay! Surprise! 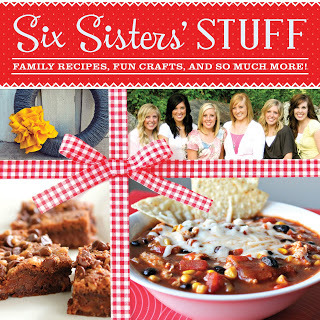 There are not only recipes in this book, but crafts and other tidbits as well. There is a cute wooden snowman, a wreath, a sock puppet, an ice cream cone pinata, a kid sprinkler car wash, and a bunch more. There is also some really good information like putting together 72 hour kits, a 14 Days of Valentine’s Day for your spouse, and one that I will be using shortly (if spring ever comes…. )–a spring cleaning guide. What more could you want? This book is the Everything-Family manual. It’s a lot of fun, and I am excited to jump in and make some stuff! 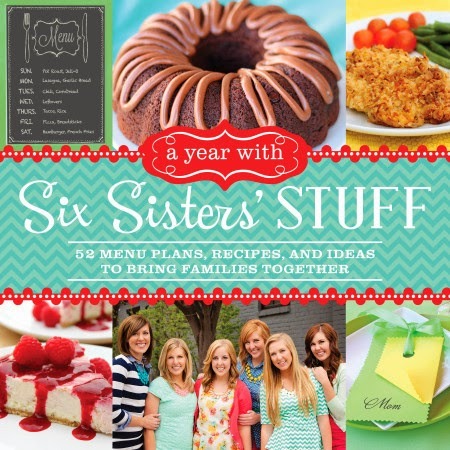 The Six Sisters think it is very important that families eat dinner together, and they hope this book makes it easier for families to do just that. They are launching a 4×4 Dinner Challenge in conjunction with the release of their book, and are hoping families will go to their website www.SixSistersStuff.com and register. You will receive meal tips, ideas for family activites, and helpful recipes to assist in making this challenge a reality. leave a comment that you are joining the challenge. I loved looking through this cookbook and will definitely be spending a lot of time with it in the weeks to come. There will be lots of new dinners to try for sure! And, I think the crafts are easy enough that I (completely non-crafty) will be able to do them.